Hello denizens of Madison Beer Review! I'm Travis, one of the news guys. Nice to meet you all. I managed to get Jeff drunk enough at his charity brewers party a few weekends ago that he invited me to come write over here. Some of you may have seen some of my ramblings over at my personal blog, 43north/89west. I'd like to thank Jeff for the humbling opportunity to join the team as MBR enters a new, collaborative phase. I look forward to polluting the innerwebs with Jeff and Matt for a good long while! My first bit is my take on a new hop bomb from the the burgeoning Central Wisconsin brewing scene. Central Waters Brewing out of Amherst, WI has made quite a name for itself over the past couple years with a series of big beers that spoke to the then-current trend in craft brewing - bourbon barrel aging (it would seem that the Belgian-stlyle pale or IPA is the next big thing). Barrel-aged versions of their imperial stout, coffee stout, and barleywine put them on the national radar with high ratings on both beer advocate and Rate Beer (if you're into that sort of thing). Hoppy styles have never been a focus for Central Waters. While I know I'm not alone in bemoaning the loss of their excellent Lac du Bay IPA (replaced with the solid Glacial Trail IPA), CW's strong point has always been their stouts and barleywines. 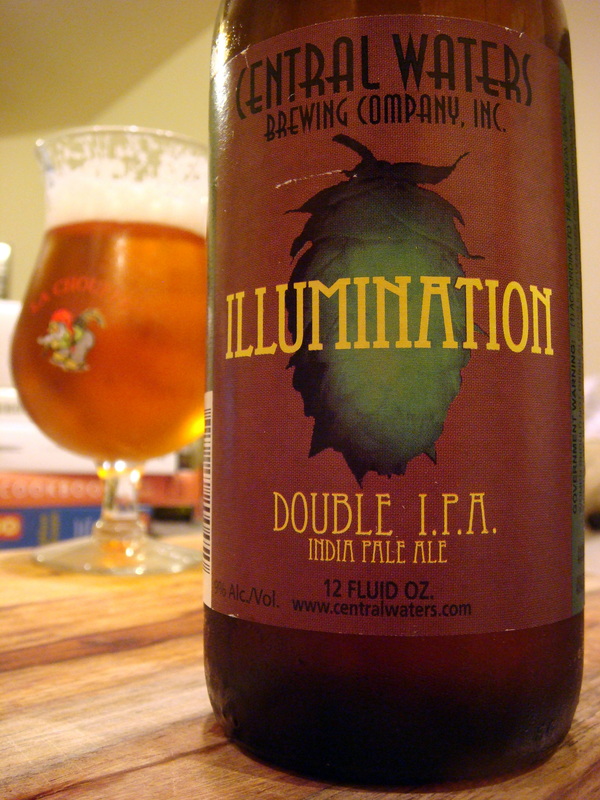 Their most recent offering, Illumination Double IPA, marks their entry into the extreme hops category. Could a brewery known for their barrel-aged takes on rich, malty styles pull off a tongue-scorching DIPA? I was certainly willing to put my palate on the line to find out. Company Line: "Can you say palate wrecker? This Double IPA comes in at 108 IBUs. As hoppy as it gets with a mouthful of citrus flavors. Grab one today and illuminate your tastebuds." My take: pours a vibrant amber in the glass, producing ample sticky foam that hangs around. Aroma bursts with pine sap, grapefruit, mango and apricot. Palate brings clean piney hops, citrus peel, tropical fruit and bready malt. Mouthfeel softens considerably as the beer warms and the smooth, spicy malt shines through the brash hops edge. Some cooling alcohol in the finish, but overall, the considerable abv is well-masked. My first sample of this beer, shared among a group of considerable beer palates two weekends ago, gave many of us an impression of cooked vegetables reminiscent of Oscar Blues' Gubna. While not entirely unpleasant, it wasn't exactly desirable and distracted somewhat from the purity of the hop profile and robustness of its malt backbone. I didn't get any of that in tonight's bottle, however, leading one to blame either inconsistency or wonky palates for the aforementioned vegetal character. Based on my latest experience, Central Waters has crafted a crisp, juicy double IPA that does well to cut through the sticky June air like the lightning that has illuminated the night sky for so many recent nights. Pretty picture and nice write-up, Travis. I'll be checking out MBR more frequently now that you're here. While perhaps Wisconsin's best hoppy beer, Illumination doesn't stack up to the world-class DIPAs out there (west coast stuff, or even Hopslam). Not enough balance for me. The Gubna comment is a good one, too. Hey, maybe CW should barrel age it! I get that vegetable-note in some bottles, but not others in the same batch of hoppy homebrew across several different batches. I think it depends on my palate at the moment, but I haven't exactly figured it out. Dry-hopping is maybe involved. Severstad - could not disagree more. I brought a trunk load of West Coast IPA's and DIPA's up from Illinois and had Illumination side by side. I find it, world class. Better than any of the CA DIPA's I tried. Port Mongo comes the closest in profile, but Illumination is better.